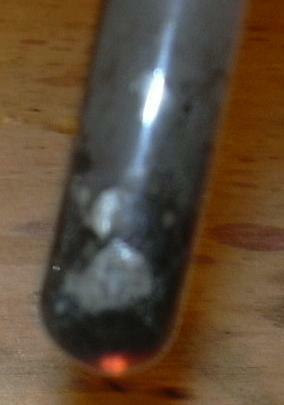 The test tube is filled with saltpeter to about 5 mm and heated with the burner. The saltpeter becomes a clear melt. 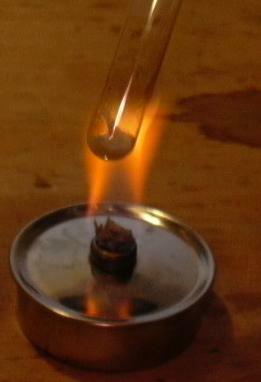 One takes the test tube out of the flame and quickly immerses into it a small wooden stick with a glowing tip. Along with the development of smoke and soot the tip continues to glow brightly. If one then holds the wooden stick in the flame of the burner, a harmless deflagration occurs at the tip, whereby it hisses as if a fuse were burning (fuses are in the fact made by dipping them into a concentrated saltpeter solution.). The residues, being of such small quantity, can be discharged into the drainage. If a simple cleaning does not suffice, one can dissolve the saltpeter residue with diluted sulphuric acid, the adhering soot can be brushed off with alcohol. Saltpeter acts under heat as a powerful oxidant, it splits off oxygen whereby the combustion or burning down occurs also without aeration. Thus is explained its historical use in propulsive or explosive charges, as well as in fireworks still today. Saltpeter is also used in analytical chemistry as an oxidation melt. In contrast to many anorganic salts saltpeter is easily melted. Wood smoulders away giving off smoke and soot in the melt.